I installed Tumbleweed on an encrypted ext4 root and recently it started booting very slowly. The only two leads I have is a UEFI upgrade in the meantime and a zypper dup. The system used to boot very quickly (as you'd expect from being installed on NVMe) for the first few times after installing. Windows 10 on the same machine on a SATA SSD boots quickly. Shutdown is painfully slow as well, likely related. Those two look slow. However, I suspect that they include the time it takes to type in the encryption key. That one is on a VM (with Tumbleweed). However, it is setup to get the encryption key from a file, so there isn't any user interaction time. This one is for my main desktop sytem running Leap 15.0. I do enter the key at the keyboard on this one. On another computer, with Tumbleweed, I got around 14 seconds (again, I enter the key at the keyboard). I was deliberately slow in typing in the encryption key for that reboot, and I think that's why the time is as long as it is. I'm not sure what the issue is in your case. You should know whether you were slow typing in the encryption key. Another possibility is that Plymouth is slow. Maybe I should mention that I'm not really using Plymouth here. Well, I guess I am, but not in the usual way. I have removed "splash=silent" from the boot command line, and I'm prompted at the command line for the encryption key (instead of being prompted in a graphic window). 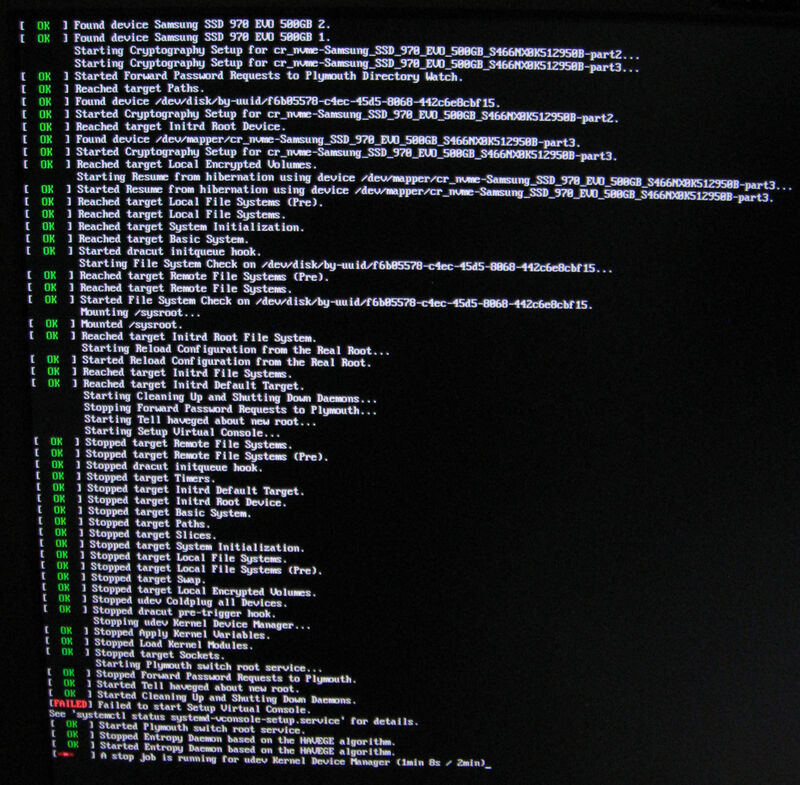 But I think it is still Plymouth prompting me at the command line and passing the key along to the kernel. It is a long key that I type manually, but booting takes a very long time after I already entered it, and it used to work quickly before. I already thought about reinstalling since there's not much on it yet, but I'm not even sure if this is a misconfiguration somewhere or a bug and if it was a bug, finding the cause would be useful. After you have entered the encryption key, and it appears to have been read (the box where you enter it is gone), try hitting ESC. You should get progress messages on the screen. Maybe those will hint at where the problem is. And you can also use ESC during shutdown, to see the shutdown messages. Oops. I missed that the first time through. I'm not seeing anything obvious there. You can also examine the output of "dmesg". What desktop environment do you use? And what displaymanager handles your login? I'm using Plasma 5 with sddm. [  246.018690] systemd-journald: Received SIGTERM from PID 1 (systemd). I have now reinstalled the system with btrfs and snapshots, and the same problem appears again. The slow boot curiously only happens after booting the system the second time after installing updates. I don't know whether openQA boots VMs multiple times in test runs, but if not, this might be why this error slipped through. Something must keep changing boot config here. Booting the "after installation" snapshot will boot the system rather quickly, but reboot is slow as well. 4 min spent in initrd looks like those two hanging points below, having a timeout of 2 + 2 = 4 minutes. I also found a Debian bug about it, maybe it's related? Is there anything I could do to help debug this? That debian bug seems to involve one LVM being defined as part of another LVM. I don't think that situation applies to you. What is unclear, for your situation, is how much of that "initrd" time is just the time it takes you to type in the encryption key. Definitely not four minutes, and as I said before, the hangs happen *after* I already typed the key in both GRUB and Plymouth.